get the results you’re after..
Let’s face it… Having a coach to guide you and deliver the perfect program is WAY more effective than doing it on your own. Our team of professionals all hold advanced degrees and industry-leading certifications. Our unique system has developed through PROVEN science and 70 combined years of real-world experience. "This past Saturday I completed the Rim to Rim Trail at the Grand Canyon, covering the 25 miles in 9 hours (My goal!). I owe Athlon many thanks for assisting me in my training over the past six months. All the preparation and coaching they provided really allowed me to enjoy the entire experience of the hike across the Grand Canyon." "I am most grateful to Athlon for helping foster a love of exercise and a desire to be physically fit. Their enthusiasm and commitment to my program and success helped make all the difference. I can honestly say that this experience has changed my life!" "I was really impressed with the knowledge and passion that the Athlon Elite trainers have for sports performance and fitness. They’ll push you hard to help you achieve your goals. I’m so glad I attended this speed camp. Not only was I more prepared to begin my season, but I was able to achieve all my goals, including an increase in my vertical by at least 5 inches! I now hit harder, jump higher, and move faster than I ever have before. 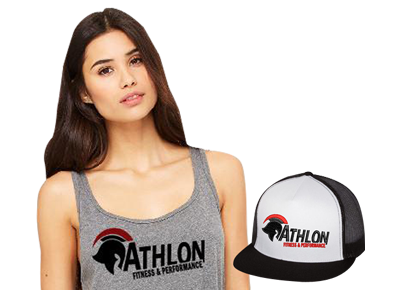 I would definitely recommend Athlon Elite to any athlete who wants to be ahead of the game, and eliminate the competition." "I’ve been training at Athlon for the past 5 off seasons and have seen tremendous improvements in my strength and flexibility as a result of their training programs. As a Triple-A baseball player I’ve trained in many “elite” training facilities around the country and none quite compare to Athlon and the knowledge and adaptability of Ryan Joiner and his team of professional trainers. Their programs perfectly translate to baseball performance. I would highly recommend Athlon to anyone wanting to improve. They understand the human body and create the most dynamic program to fit it’s individual needs. Thanks Athlon"
"I’m eating better. I’m sleeping better. I’ve met some wonderful people at Athlon that makes it easier to keep going. I feel much better about wearing my clothes; they fit nicer. I’ve become much stronger and it’s positively affected my golf game, I’m improving that as well. Athlon is really a wonderful place!" "I’ve enjoyed working out with you guys a ton, and appreciate the attitude and approach you have to working out. You guys really helped me out of the rut I was stuck in after I hurt my ankle. It was just what I needed." "I have been training with Athlon for four months now. Their knowledge and willingness to adapt exercises and routines that worked for me was incredibly helpful. Their passion about nutrition was truly a unique and critical asset for me. Their working knowledge of WHAT and WHEN I should eat helped me to get results. The exercise programs are like nothing I have ever done before. The fact that the routines are not traditional, allowed me to gain strength and flexibility that I haven’t had in years..."
"With the demands of profession and family, the time I have to train is limited. I wasn’t getting enough out of my workouts. All of that changed when I started training with Ryan. He showed me how to get results through training at a higher metabolic level. My gains in core strength and fat loss far exceeded my expectations. I’d recommend Ryan Joiner to anyone, and in fact I’ve had him train my two kids (who are not really kids anymore)." "Ryan Joiner and the team at Athlon Elite have empowered me to transform my body and my physical abilities. Over the past 2 1/2 months, I have been training under the ‘Growth Program’. During this time period, I lost 4 1/2 pounds of fat and gained 9 1/2 pounds of lean muscle. This week I am starting the ‘Marathon Program’ — a combination of running and strength training — that is going to more than adequately prepare me for a half marathon that I’ll be running..."
"I think you have put together a great program with very dedicated and knowledgeable trainers. My workouts are truly one of the highlights of my day. I tell everyone I’m in better shape now than I was in my 20’s!" rated 4.9/ 5 from 52 customers! Great experience! Staff was friendly and knowledgeable. The staff is excellent and works hard to help you achieve your fitness goals. Look forward to my workouts each week and know I am benefitting big time. As a kickboxer I was lacking explosiveness. The strength training I’ve done at Athlon has really sharpened my delivery. I love this place! It is unlike any gym I have gone to in the past. Every time I go, I work a different part of my body doing different exercises and workouts. Angela is a super trainer. I highly recommend her! She's tough but a great motivator!